TSN panelist Darren Pang reported that an insider close to the Nashville Predators has stated that the franchise has fired associate coach, Peter Horachek, after nearly ten years with the team. 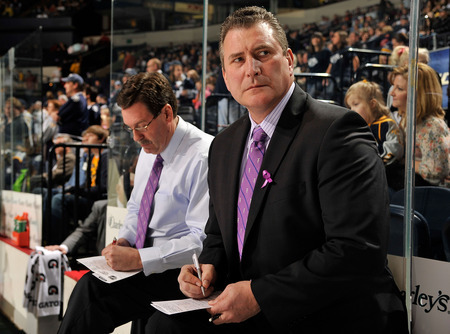 Horachek was hired by the Predators during the 2002-2003 season and was assigned to coach the Predators’ AHL affiliate, the Milwaukee Admirals. The following season, he joined the staff of the Predators as assistant coach, replacing Paul Gardner. Horachek was then promoted to associate coach before the start of the 2011-2012 season, replacing Brent Peterson who was battling with Parkinson’s Disease. Some believe this move is a show of laying blame on someone for Nashville’s poor performance during the lockout-shortened 2012-2013 season, but the Predators have not been reached for comment thus far. Predators Fire Associate Coach Peter Horachek. Horachek makes only the second coach to have ever been fired from the Predators franchise, right behind the man he replaced in 2003, Paul Gardner. Horachek has interviewed for Head Coach positions with the Dallas Stars and Florida Panthers within the past few years. It’s worth noting that Dallas fired their Head Coach, Glen Gulutzan, only a week ago. Maybe Horachek won’t be without a job for too long.